Made with Greek yogurt, chestnuts and oats, this smoothie is a filling way to keep things healthy with the New Year right around the corner. With Christmas two days away, I have a confession to make. You guys, I’m sick of seeing all the Christmas treats! Don’t get me wrong, I’m going to fully enjoy eating my fair share tomorrow and Christmas day but I seriously can’t wait for New Years and people to be “into” healthy things again! Enough.with.the.sweets. My teeth hurt just scrolling through them all on Facebook and Pinterest. 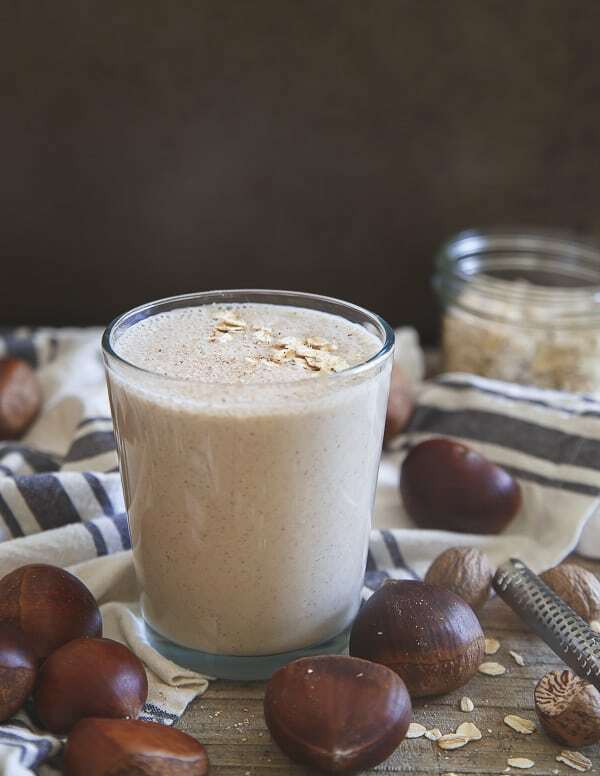 So to get a jump start on the “healthy” thing we’re all a little more willing to entertain in just a few days, I’m sharing this cinnamon chestnut oat smoothie with you. January 9th I’ll be on a plane to Mexico and one of my bucket-list places, Cabo San Lucas. Ulysses and my brother are riding dirt bikes the length of the entire Baja peninsula the week before and my sister in law and I are flying to Cabo to meet them at the end for a week. I don’t really know why I’ve wanted to go to Cabo forever but I have so despite the timing of wearing a bathing suit directly after all the holiday cookie madness, we’re making it happen. Which is why between now and then you’ll find me downing things like this smoothie. It’s filling and satisfying thanks to the hearty serving of oats but still wintery and comforting with chestnuts, cinnamon and nutmeg. It’s also chock full of protein thanks to an entire container of Yoplait® Plenti I grabbed at Walmart. 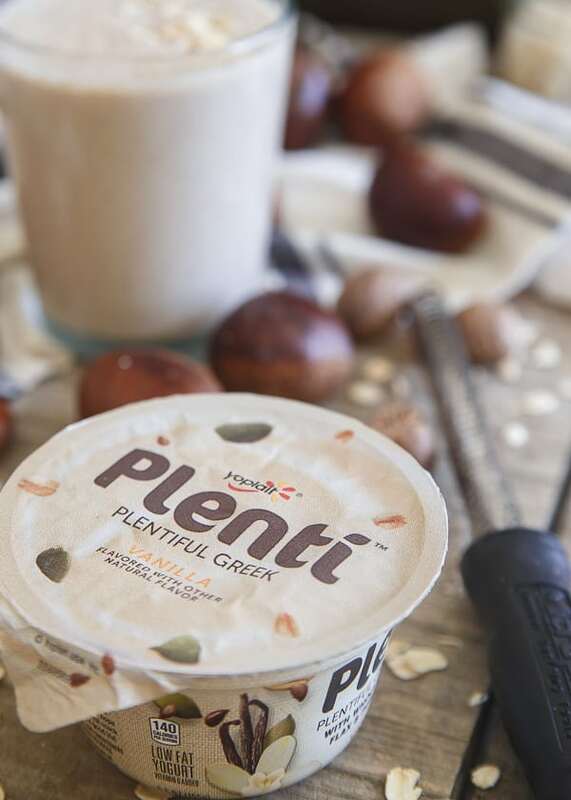 Yoplait Plenti is filled with oats and seeds to make it a bit more satisfying than you’re normal container of Greek yogurt which made it perfect for this smoothie. Truth is, and if you follow me on snapchat you probably already know since I like to complain about all the food I get to make and then not eat, I’ve been following a macro and timing nutrition plan for the last 3 months. My 12 week “cut” ends January 1 (yeah who’s the genius who decided to cut over the entire span of the holidays? Me.) so I’m actually feeling really great about where I am headed into a beach trip right after Christmas. That said, every other year come January 1, I’m usually ready to flip the switch and get myself back on track. It’s never anything drastic, it’s just a few less chocolates and cookies and few more healthy choices. Things like smoothies make an appearance in the afternoon instead of tea + cookies (or a few of the Godiva chocolates my mother in law sends us every year!). They’re simple, so versatile and can still be made delicious even when they’re healthy. And guess what? 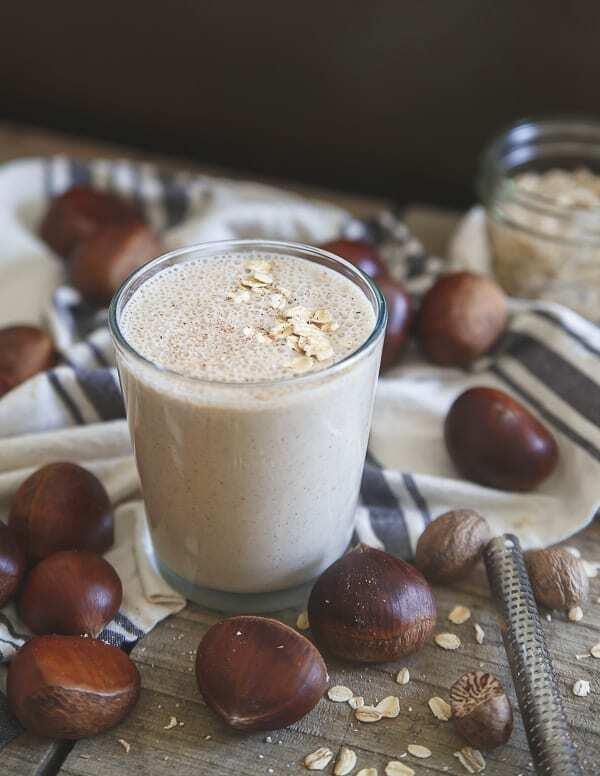 Like this cinnamon chestnut oat smoothie proves, they don’t all have to be green to be good for you! Pour into a glass and garnish with cinnamon, nutmeg and oats if desired. Gina, I am so with you!!!! We were suppose to bring a dessert to a party last night and I felt like scrooge because I just didn’t want anything sweet at all!! BTW this smoothie looks great! This sounds wonderful! I love adding Greek Yogurt to my smoothies! I’m right there with you. I have enjoyed way too many cookies and chocolates and will be glad to clean up my eating! 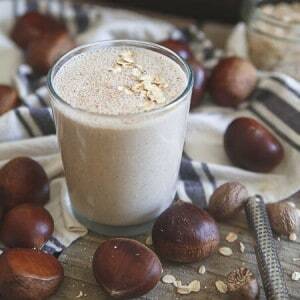 I love this smoothie, the chestnuts are a perfect winter touch! I’m sick of Christmas treats too – I just want to dive into this smoothie right now. Smoothies for life. I loved your snapchat about this by the way. can I use canned chestnuts? Yeah, they should work so long as they’re cooked and soft.